We specialize in good quality installations with a lot of attention spent on the little details. Such as transitions between other floor coverings, doorways. We always use the manufactures recommendations when comes to installing their products. 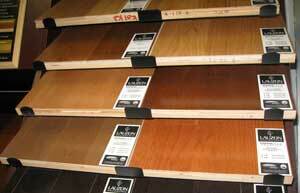 Sub-floor is the pre-existing floor that is either underneath your carpet or an already existing wood floor. 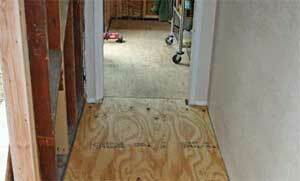 Sub-floors can either be plywood, OSB chip board or concrete slab. 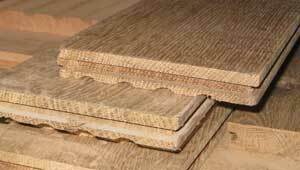 Engineered floors tend to be easier when dealing with concrete slab, while solid wood works on concrete,but requires plywood sheathing to be glued and attached to slab, which incurs more cost and height elevation issues. However,we have completed a lot of jobs that way over the years. Most ofSolid wood installs are typical on raised foundations. Solid wood requires time to be installed by typically glue and nail down, with a two to three week acclimation period. This gives the wood time to expand and contract. Then the wood is t sanded smooth to eliminate imperfections and any uneven areas(over wood) in the floor. Cracks are filled at this time. The wood is then stained by hand, if color is desired.After drying, three coats of polyurethane finish is applied giving it that durability and shine. Prefinished engineered floors are a convenient and yet great floors to install over a concrete slab. They can be installed directly to the concrete. However, we highly recommend using a moisture barrier to prevent moisture from coming up through the slab. Prefinished floors, like anything has come along way with advanced technology in the manufacturing process and the durability of the finishes they use. Some of your better lines, like Mirage and Lauzon have created some great products.